In addition, FaderWorks provides controls for adjusting and compensating latency within a multitrack setup (PDC). Every instance of FaderWorks is assigned to a group. By default, all instances belonging to the same group have identical volume levels. Moving the volume fader in one instance simultaneously changes the volume of all other instances in the same group. The relationship between groups is configured via the integrated connection matrix, available in every instance. Therefore, the connection settings can be updated immediately without switching to another plug-in instance. Crossfade with a default crossover level of -6 dB. This level can be changed to avoid an increase or a decrease of volume at the crossover point, e.g. because of phase cancellation. Multiply & Offset - based on the source volume, the destination volume is calculated by multiplying the source volume with an adjustable factor and then adding the specified offset. Connections can be cascaded, e.g. group 1 depends on group 2, whereas group 2 depends on group 3. Changing the volume fader of any connected group simultaneously changes the volume in all connected groups according to the connection settings, e.g. moving the volume fader in group 2 updates the volume of group 1 and of group 3. FaderWorks incorporates solo, mute & bypass functionality known from mixing consoles. For efficient virtual signal routing these switches work on 3 different logical layers. Just one click is needed to mute or bypass all instances. These are global switches that can be activated from any instance. For flexible selection of active groups and instances, every instance is equipped with 2 solo/mute/bypass switch combinations. The first one is for switching groups and the second one is for switching the current instance with respect to all other instances in the current group. Individual instances can also be bypassed without affecting other instances. Volume for calculation in the connection matrix (the default). Sum of the levels mentioned above. The effective volume applied to the audio signal is determined from the sum of the first 3 components listed above. Individual offset and group offset can be switched on and off for every instance. FaderWorks provides a generic concept to handle Plug-In Delay Compensation (PDC). It is an efficient, deterministic and sample accurate approach. You can setup a database of plug-in names and latency values which is shared between all instances. Place one instance of FaderWorks on every track and switch the appropriate latency values off or on. MIDI CCs as well as pitch bend and aftertouch can be assigned to gain parameters, offset switches and solo/mute/bypass switches. For gain parameters, several mapping curves and value ranges are available. Ideal for external control surfaces. Dynamically assigned virtual aux tracks that overlap logically. Quick A/B-comparison of newly recorded tracks - single tracks or a group of tracks can be crossfaded or switched against each other. Enclose selected audio-plugins by 2 connected instances of FaderWorks for achieving an "overdrive" effect with simultaneous control of the overall volume. Selected vocal tracks of a choir can be increased in volume while at the same time the volume of all other choir tracks is reduced and vice versa. Plug-In Delay Compensation for hosts without this feature. Plug-In Delay Compensation when using external hardware with your DAW. Volume control with logically connected instances for flexible mixing of audio tracks, enhanced by solo/mute and bypass functionality. Assignments of instances to groups for efficient handling. Solo/mute/bypass for all instances within a group. Bypass for the current instance without affecting other instances. Group volume offset, switchable for every instance. Individual volume offset for every instance, switchable. Connection matrix for defining dependencies between different instances/groups. Crossfade with adjustable crossover level. Multiply & offset with positive and negative multiplication factors. Connections in the matrix can be combined in serial and in parallel. Moving any fader belonging to a connection automatically updates all other connected faders. Connection matrix available from every instance. Volume for calculation in the connection matrix. 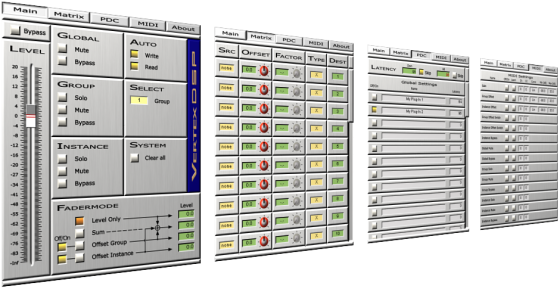 PDC: Complete plug-in delay compensation system for every host with internal latency database, suitable for multitrack environments and for use with external hardware. Parameter automation for volume levels and level switches. MIDI support for all exported parameters and for the solo/mute/bypass switches. Reading and writing of automation switchable from every instance. Support for native 64 bit processing (VST only). "I am highly satisfied with the product." "Does a great job. Highly recommended!" "I love the Automatic Latency Compensation it provides." • Changes of PDC settings now take effect immediately without (re)starting audio. • The slider position on the PDC page is now remembered. • ProTools no longer resets shared data when adding a new instance of FaderWorks. • MIDI support for exported parameters with sensitivity curves and selectable value ranges. • MIDI support for solo/mute/bypass switches. • The last page opened in the GUI is now remembered. • Support for fxpansion VST-RTAS wrapper. •	Loading of a preset for one instance did not update other instances under certain circumstances. • The Latency/PDC settings are now on an own page with a database-like PDC management. • New GUI engine with faster response to user interaction, especially for connected volume faders. • The fader handle can now be grabbed without automatic snapping to the mouse position. • Performance improvements, especially for the latency mode. •	The latency value was always marked as red when opening the GUI. •	Group offset volume changes were not sent to all instances (AU version only). •	New latency option for managing latency/delay assignments across all instances. •	The 1in-1out configuration of the mono version was not detected properly (VST only). •	Fixed a bug that could cause processing of the wrong input channel under rare circumstances.